The cutting list in txt can be opened directly into excel using a “;” as separator. But you can set them up in any order you want. I attach a zip file that contains the excel file that I made this way. This project contains no machining details and I’m sorry but I can not regenerate this project a second time. I suggest you buy the full version and then use the free hours training so that I can help you to setup all the output as you need it. We couldn’t see any machining details except the dado (groove). I think that is because i haven’t set it up. I’ll try to set it up and can i send them again…? As agreed, I haven’t checked them, nor are they necessarily set up the best way to suit your needs. 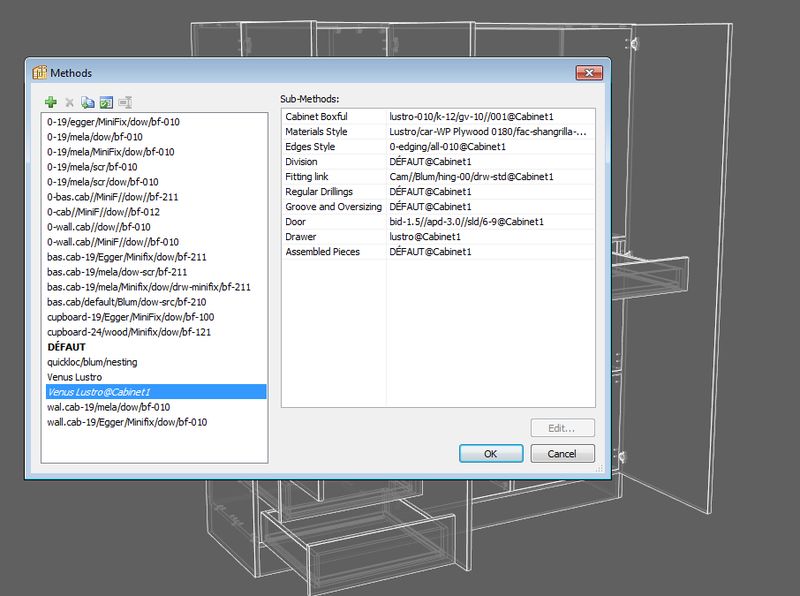 There are many options for setting up the workshop documents, cutting lists, labels, edging, dxf files etc…to get them to fit your specific needs, so consider this output as just an example. If you need anything specific just let me know. Here is a compressed file that contains the project Medall MCC saidapet manufacturing documents. 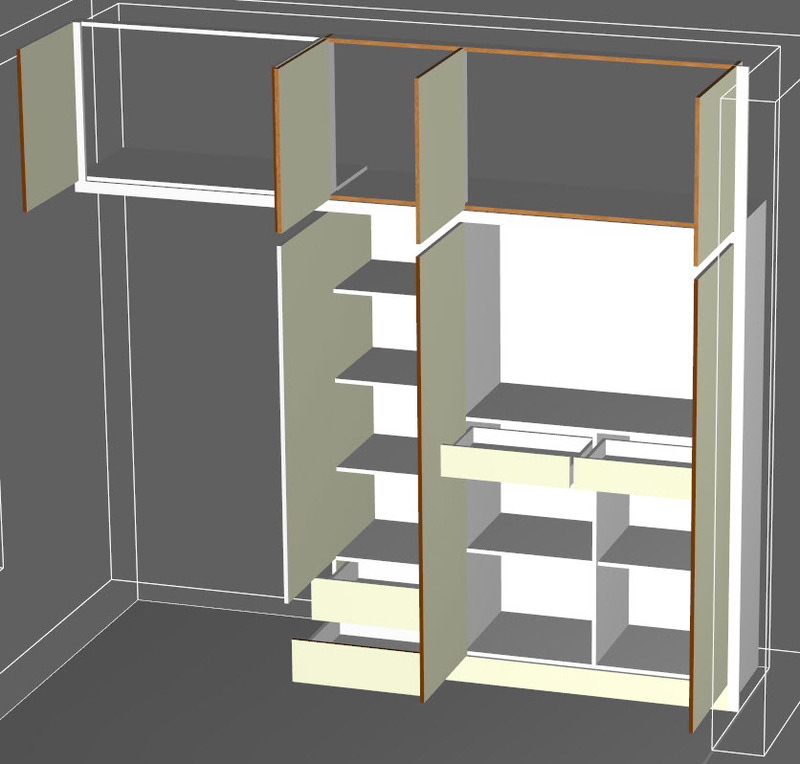 In the project folder you will find the files processed from the project that contain all the cabinets. 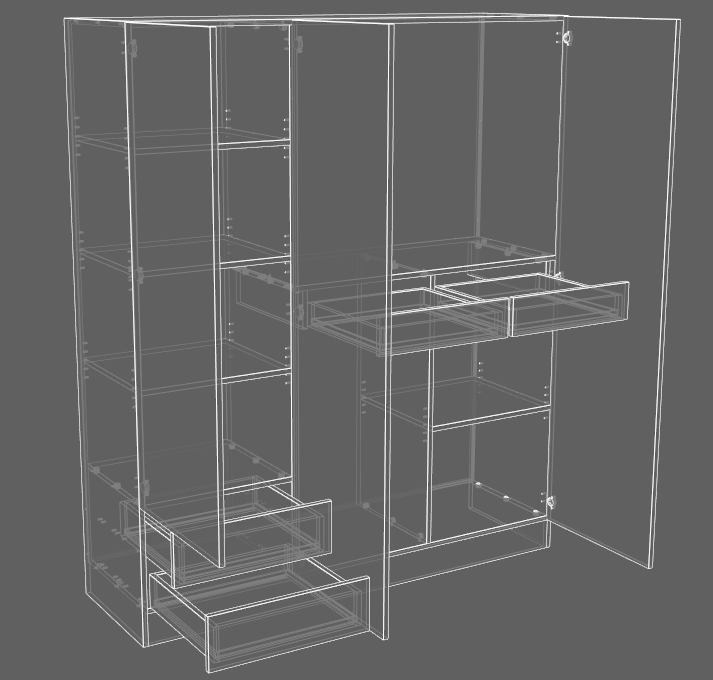 In the other folders I have created some of the working documents for a few separate cabinets. I have used a standard formatting that we usually set up for our Partner Suppliers, but you can of course use and column order and formatting that you want. 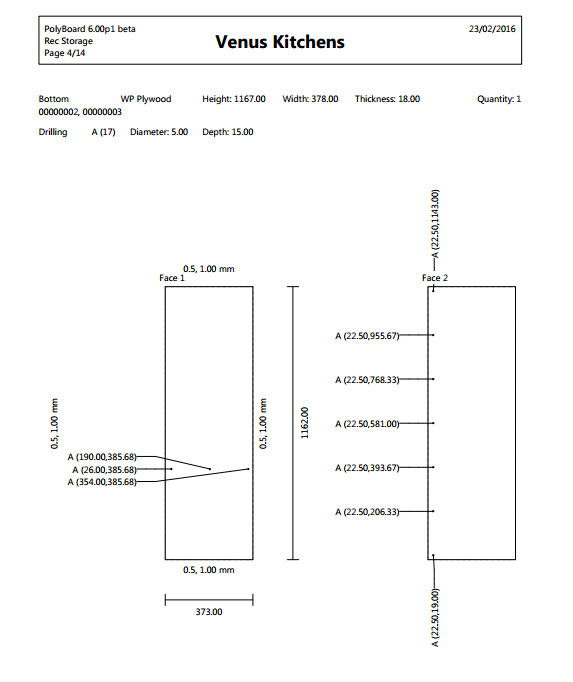 You can see that I have linked the cutting list to the CNC export so that each part has its machine file name attached. Note that it is possible to print the bar codes of the machine files onto the labels of each part. This enables you to use a scanner on the label to load the correct machine file. 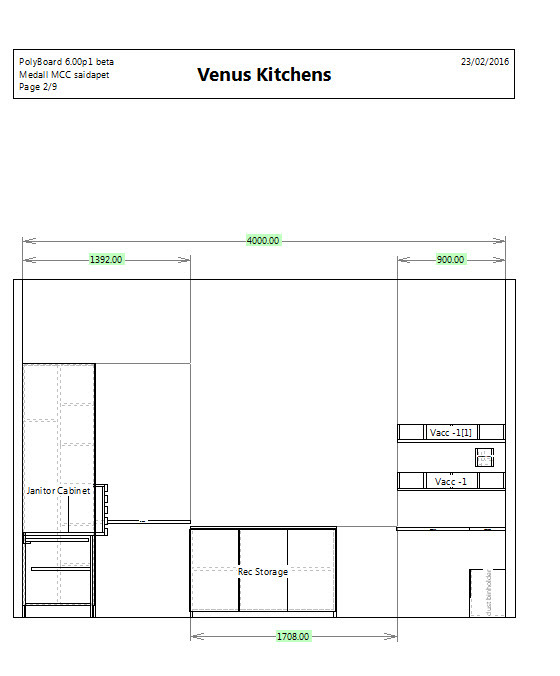 The project folder also contains the labels print out for the entire project in pdf. The labels can be set up as you want to include any specific information and bar codes if necessary. In the project folder, you will also find a “optimised” folder where I have also included the cutting lists optimised by Opticut. 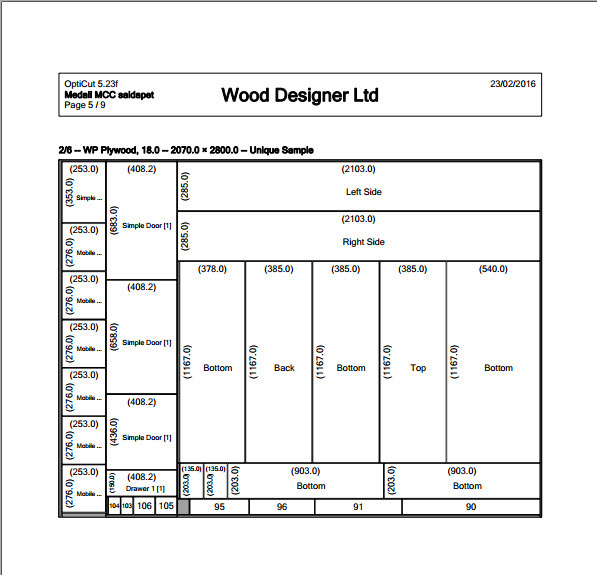 the ocp.pd file contains the report cutting maps for the project optimised onto 2800×2070 sheets. 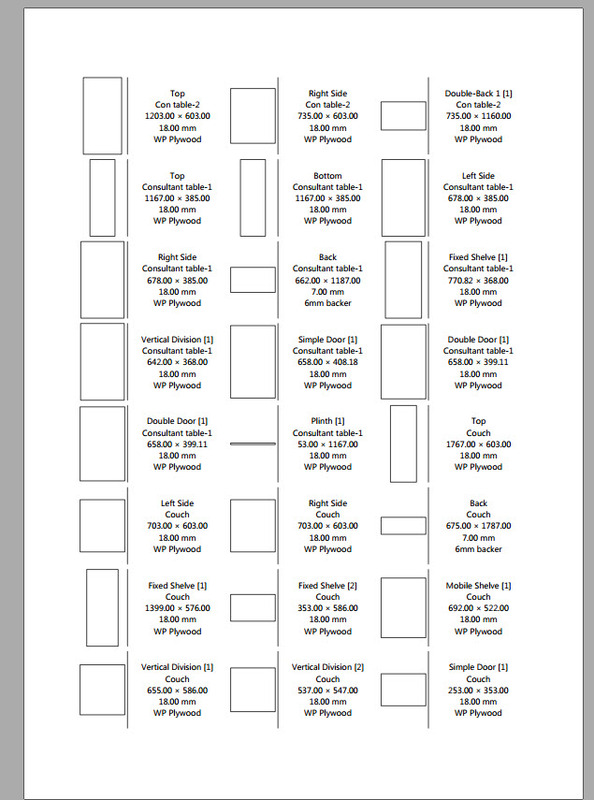 Opticut will also print labels adapted to the cutting organisation so I have also included a pdf file of the Opticut labels. 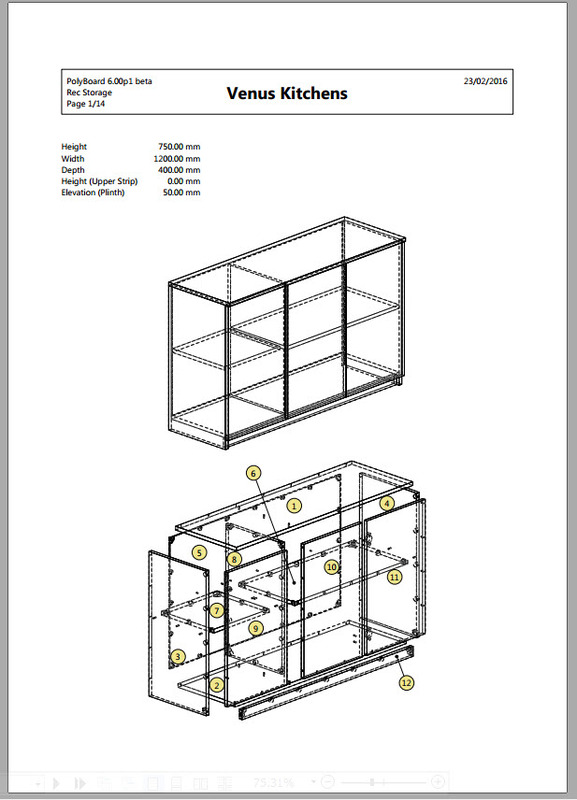 The Homag WoodWop CNC files are in the project/pp out put folder. 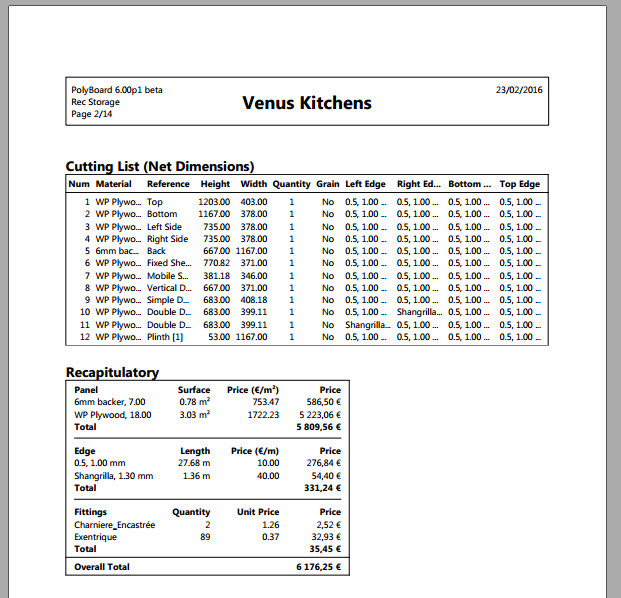 They are arranged by cabinet and you will also find PP-report txt file that can also be formated as necessary. Note that the CNC files will require setting up according to the machine set up, so these are only rough examples. 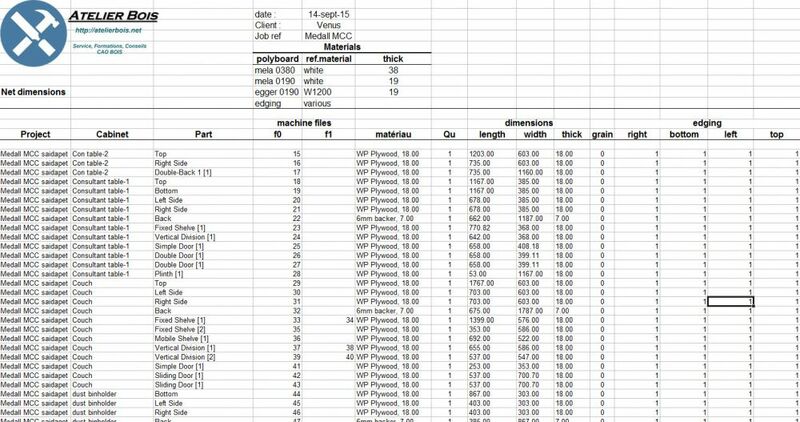 Note that if you are running Polyboard with a chinese CNC you will usually need to use the DXF output that will need a CAD/CAM program like Vcarve to interface with your machine. and here’s one that show how to set up Polyboard with Vcarve. Labels for every parts and labels for every packing or every cabinet. I have cleaned up a bit your project using the Quick Design libraries so that you have at least coherent hardware, edging and assembly details. 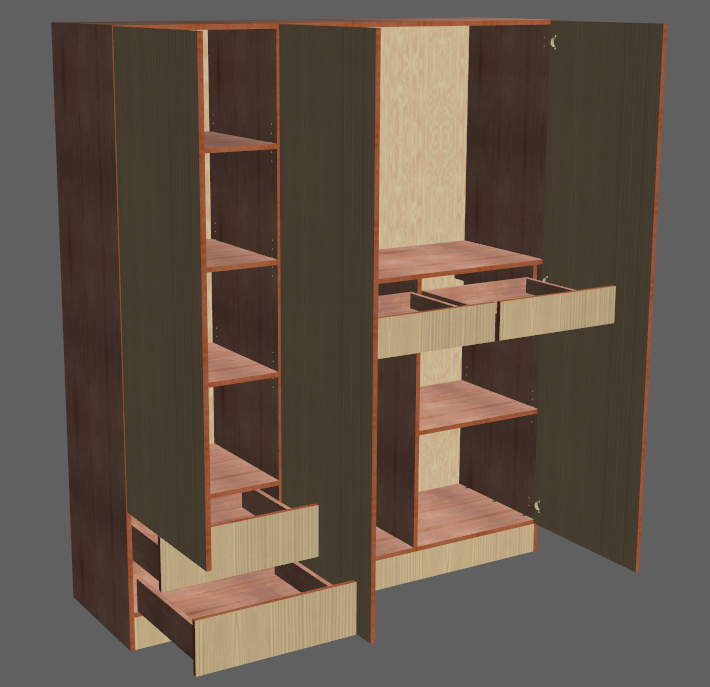 This may make some elements slightly different than your original model as the Quick Design apply standard slack values to doors drawers etc. The 3D colours are only the colour or texture applied to the material, so have no incidence on manufacturing. I attach the workshop document for this project. Do you mean the Kitchen.pb-proj ? If so do you realise that this project is no set up correctly ? Not only that but this projet contains a lot of materials and going through and checking all the parts will be long and tedious. To test Polyboard output I would suggest that you send me one cabinet file. That we help you set it up correctly according to your needs and then we send the correct manufacturing documents that you can examine in detail. No problem to send you back the Polyboard documents to test, however, you don’t seem to have attached the Polyboard file. Could you post the .pb-cab file so that we can process it? Dear Ness, The file I’ve send had material different for doors and visible sides. the inside will all be white. we also have a beading in different colour. we request you to send the complete manufacturing documents for the projects with cultists, drawings , labels, part machining details and assembly details. This is mostly for us compare it with our manual job card. I see that you have applied the default hardware from the older Polyboard libraries, these are just examples and will need to be adjusted according to the hardware you are really going to use. I would suggest that you use the Quick Design hardware and methods libraries as a basis to set up your own. 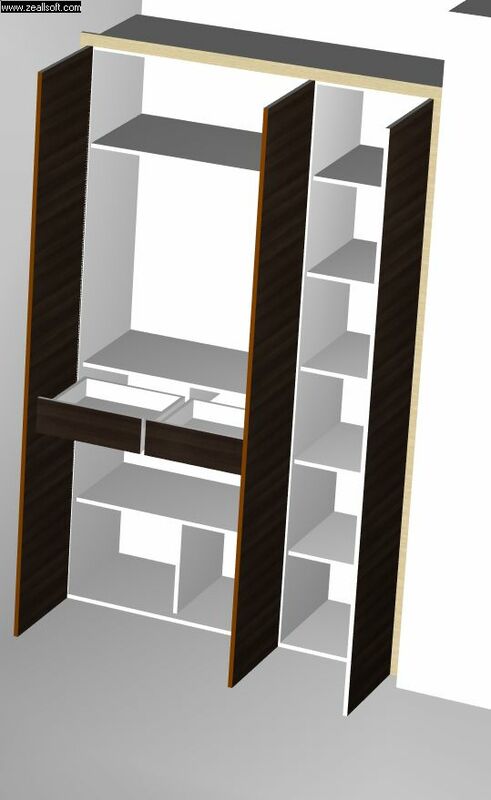 As an example I have remodeled one of your wardrobes. In this example I have changed a few Quick Design Sub-Methods libraries and called them Lustro. I have then assembled the Sub-Methods into a Manufacturing Method called Venus Lustro. By applying the Method you can change all the characteristics of any model . Note that for manufacturing methods to work you have to be rigorous in placing specific parts. Each part is named and the name is used to define how it reacts to the method. 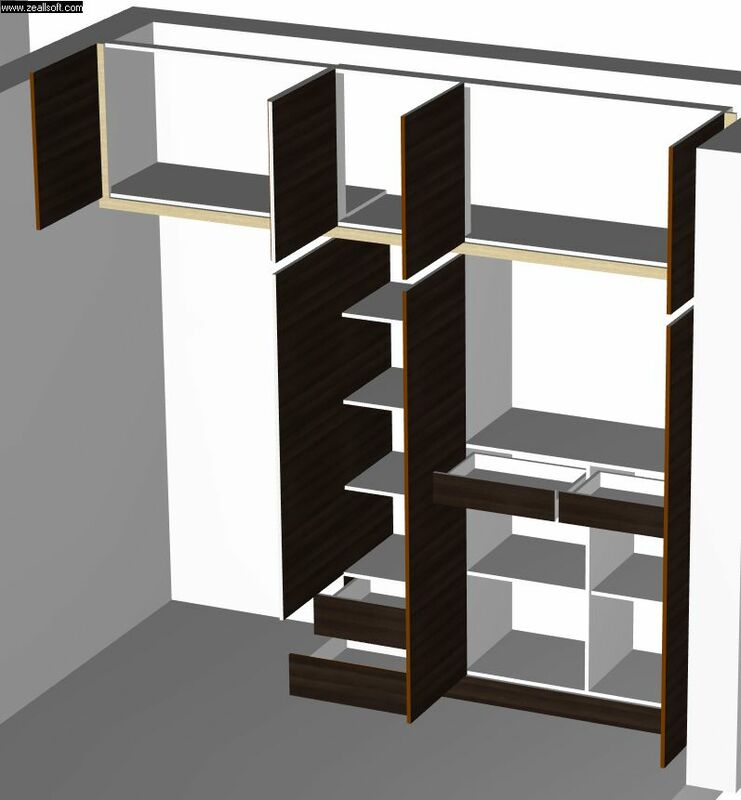 For instance fixed shelves will be placed with cams and mobile shelves with pegs. In your model I’ve also seen that you have used a double back for a plinth, it would be better to use the plinth function to have a coherent model. 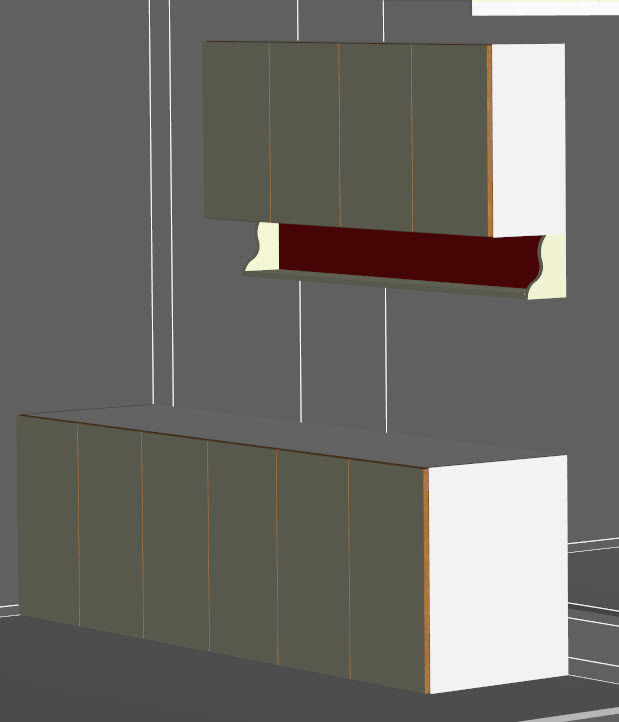 I have also added uprights to give space the drawer sides behind the double doors so that they clear the hinges. Your project will require a through revision before going to production. This will take some time and is not included in the free CabinetFile service. This service gives you one hours revision and coaching on your project. Back sheet is fixed via dado with 12mm set back. 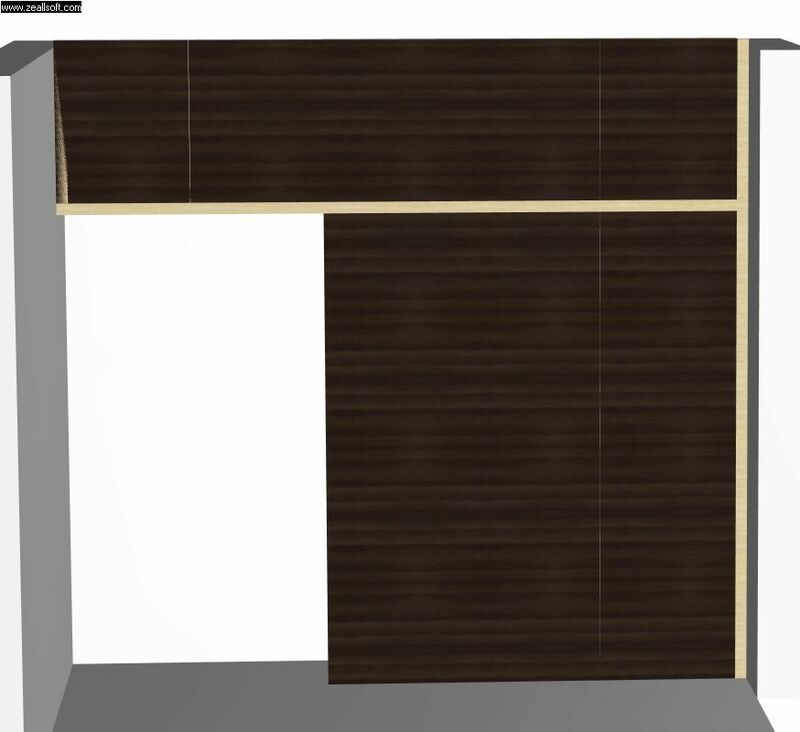 We have some places where we need only the doors with frame etc as per the drawing.